In 1970, Black Sabbath recorded their debut album in only two days and within a year had sold 4 million albums and started on an incredible path that would one day lead them to the Rock and Roll Hall of Fame. Guitarist Tony Iommi was quickly signaled out as the leading guitarist of a new sound--heavy metal. Now, Epiphone is proud to present the Tony Iommi G-400. More than just a new spin on our Epiphone SG classic, the Tony Iommi G-400 is a bold step into the future. The Tony Iommi G-400 was designed by Tony along with Epiphone luthiers to give players a totally distinctive instrument that still has all the key elements of a classic SG but with something new under the hood that would make audiences and bandmembers alike take notice. And best of all, the Tony Iommi G-400 doesn’t come with a vintage price or the headaches of a vintage instrument. In the words of Guitar World: "Epiphone's Tony Iommi Signature G-400 has devilish good looks and great sound and playability, all at a price that won't send your bank account straight to hell. Best of all, it's Iommi approved." And like all Epiphones the Tony Iommi G-400 includes our Limited Lifetime Warranty and Gibson’s famous 24/7/365 customer service. Visit your authorized Epiphone dealer today and make history on the Tony Iommi G-400! 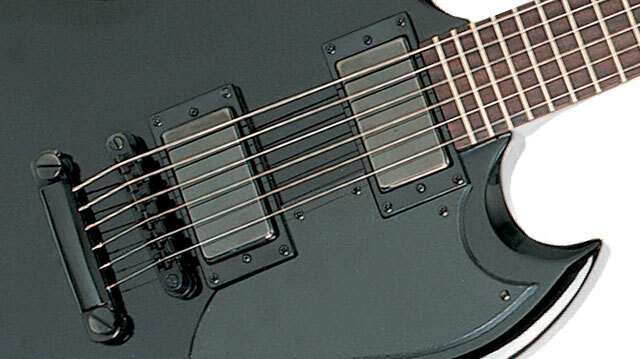 When the SG or "Solid Guitar" was introduced in 1961 as a replacement for the Les Paul, it was called the "fretless wonder" for its low frets and fast action. The twin horn cutaway design was like nothing on the market and its light but balanced weight made the SG the perfect guitar for stage and studio work. Later ‘60s models introduced the SG with humbucker pickups, and since then, the SG has become the go-to guitar for artists in every genre including The Who's Pete Townshend, Tony Iommi, Paul Weller, AC/DC's Angus Young, George Harrison, Eric Clapton and Derek Trucks of the Allman Brothers Band. 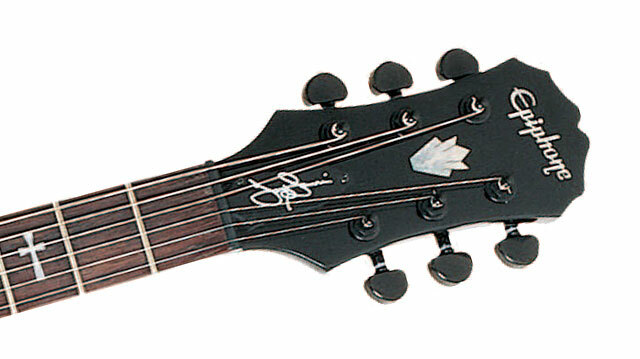 The Tony Iommi G-400 shares the same dimensions and build techniques of classic SG guitars. The solid mahogany body gives the guitar a balanced feel on stage and in the studio (unlike cheap imitations that tend to be neck-heavy). The SlimTaper™ “D” profile 12” radius mahogany neck is glued-in and features a 24.75” scale with 24 frets. And just like the originals, the Tony Iommi G-400 has a rosewood fingerboard with a 1.68” nut with the added touch of pearloid cross inlays at frets 3, 5, 7, and 12 along with Tony’s signature on the trussrod cover. Nobody sounds like Tony Iommi but now you can get closer than most mortals. For his signature G-400, Tony Iommi chose the specially wound Gibson USA Tony Iommi humbucker pickups for that demonic roar. Epiphone leads the way in manufacturing great sounding guitars for players of all levels and that goes for our great hardware, too. Epiphone provides quality all-metal hardware on all its instruments including full function volume and tone knobs using full-size 500K O potentiometers matched with Epiphone’s rugged all-metal 3-way toggle pickup selector switch for long-lasting performance. 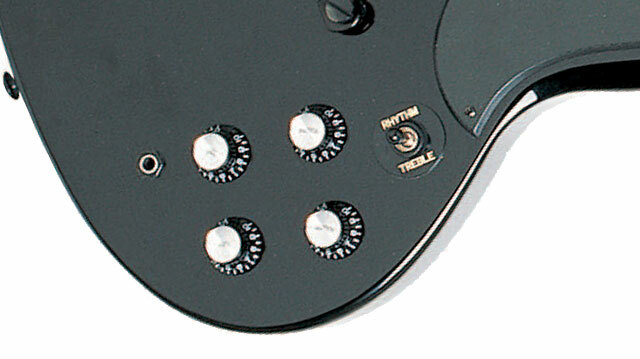 and that includes the G-400’s world famous Grover® 14:1 tuners.